If you can claim to be a data scientist and have the chops to back that up, you can pretty much write your own ticket even in this tough job market. 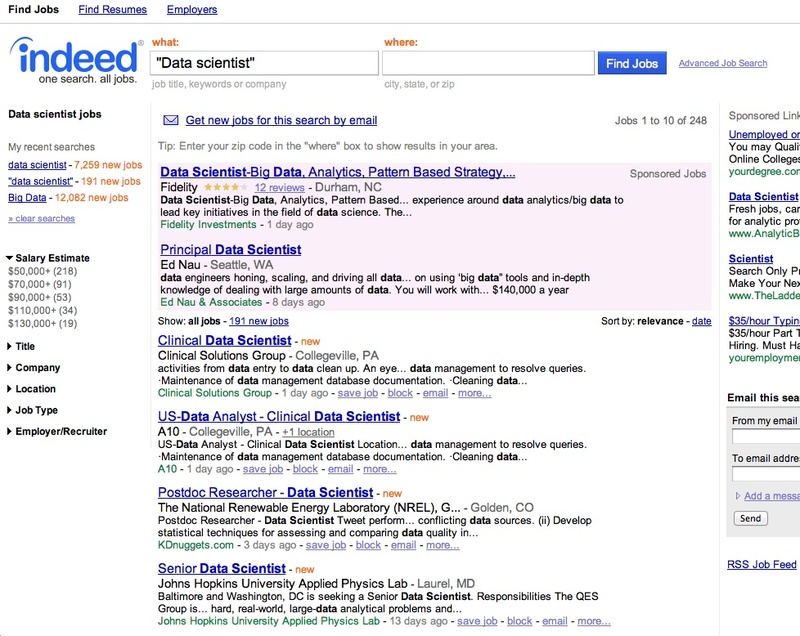 A quick search of the popular job posting sites —Indeed.com, SimplyHired.com, or Dice.com — shows a huge demand for data scientists or anyone who can demonstrate other “big data” skills. The reason? Companies in all industries now understand that they need to make better sense of the massive data sets at their disposal — data sets that can include computer log files, social networking feeds, digital video or audio, you name it. That’s led to a spike in demand for data scientists — professionals that understand math and statistics but also have a flare for “art.” They understand how to display or visualize that raw information so its value can be understood. Petabytes of data are useless if no one can make sense of it. My client is one of the largest professional services firms in the world and they are looking for very senior data analytics experts who can apply his/her advanced analytics, predictive modeling, and data visualization skills to the fraud/dispute arena. Exceptional compensation packages are available in the $300,000 to $500,000 range for the appropriate technical and leadership experience. Alice Hill, managing director for Dice.com, said her company just started tracking the category in December so it’s too early to have long-term comparisons of starting salaries or number of posts over time, but big data is nonetheless hot. “We can see shortages coming and when there are shortages, salaries go up,” she said. She sees big data posts in financial services, in retail, in e-commerce. According to recent Dice posts, Amazon(s amzn) is looking for a data scientist in seattle, Sears Holdings(s shld) seeks a Hadoop administrator in Chicago; and Cision wants a “wicked smart” software engineer/Big Data in Chicago. The VP of a big data-related vendor on the east coast just finished a sweep of career fairs at a number of universities in search of a research scientist — someone who can help develop algorithms for machine learning and for core Java developers, programmers to take those algorithms and implement them in scalable compute environments like Hadoop and Cassandra. But he also sees a burgeoning need for a “data scientist” staff position. That person would head up all the data aggregation and the big data architecture. People with the tech skills for that job are incredibly valuable, he said. While he didn’t have hard numbers on data scientist salaries specifically, he did say that in the Washington, D.C., area, a sales engineer that understands big data analytics and can implement a Hadoop architecture can command at least a 25 percent premium in salary over another highly technical sales engineer without those skills, he said. As more companies gear up their big data efforts, the imbalance between supply and demand of big data expertise will not evaporate any time soon. Big data and the skills necessary to make sense of it will be on the agenda at GigaOM’s Structure: Data Conference in New York next month. Photo courtesy of Flickr user 401K. We also see a record demand for analytics/data science professionals. KDnuggets job board http://www.kdnuggets.com/jobs had the best year in 2011, and 2012 looks to be even better. yes there are some interesting government job postings for big data. It is a much bigger movement than marketing/targeting advertising – although that piece is large. Big data is being used in national security (see Palantir and others), local crime, traffic/congestion problems (see IBM), world healthcare (see Hans Rosling’s stuff), and likely making future inroads into Pharma/life sciences that I’m not aware of. Strange that you mention Wall Street quant in the same paragraph as “making the world a better place”. They do like PhD’s but trend strongly towards Physics people. Good luck with that, their job market is terrible right now. I’m curious — obviously governments (state, local, federal) will need more big data experts. Will they be able to compete for this top talent? The problem with WS quants are: every quant is trying to become a trader and get out of the back room, every quant works for a trader and must prove themselves every minute, and everybody thinks being a quant leads to a career as a trader. You’ll have an easier time working in tech than for a trading firm. check out what IBM is doing in Healthcare in this space..
or with the City of Stockholm to reduce traffic congestion.. Success means helping to raise revenue and profit, that creates more tax dollars that fund schools, roads, firemen and so on. You could always tell yourself that your tax dollars paid to educate the fireman who saves a baby, and you’d be right. That would at least pay back part of the money that funded your graduate education at “name-brand universities”. But if the purpose of your work is to feel good about yourself and “make the world a better place” then why don’t you just go all in and settle for a minimum wage to sustain yourself while working virtually pro-bono? Or you could earn a high wage and start by helping your parents who paid for your undergraduate education in the first place, before you worry about the whole world while looking down on Wall Street quants who contribute with more tax dollars than you do. 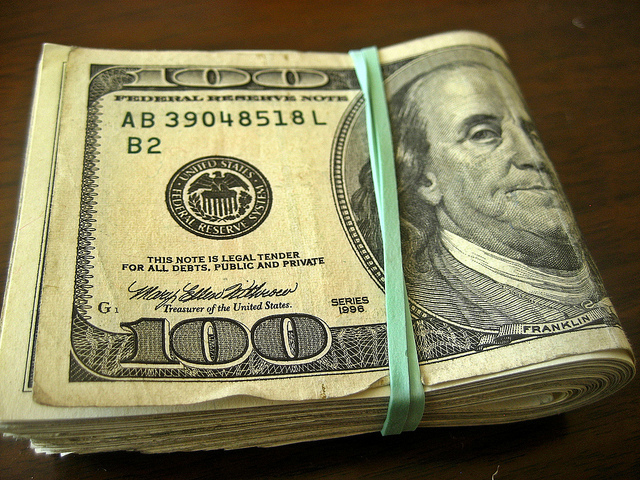 Looks like that might be the best market to break into if you are seeking to earn some money! I might have to think about that!